Jane Marlow’s debut novel is a beautifully written twenty-five-year saga of two families—one born of noble heritage and the other bound as serfs to the noble’s household. 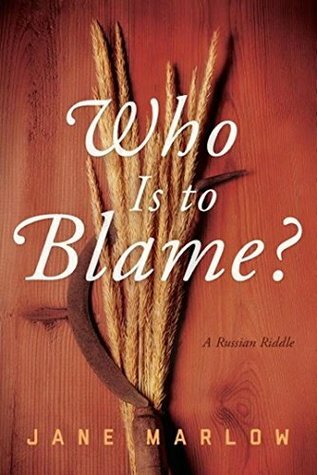 Set during the mid-1800s in the vast grainfields of Russia, Who Is to Blame? follows the lives of two star-crossed serfs, Elizaveta and Feodor, torn apart by their own families and the Church while simultaneously trapped in the inhumane life of poverty to which they were born. Who Is To Blame? is a book about which I could not quite make up my mind. I loved the plot idea and interesting period setting; however, the characters came across as too 2D for my liking. I never got to know them emotionally. Their actions were reported to me, but there was no connection. I didn't care what happened to any of them. A few of them also seemed rather stereotypical. Mid-nineteenth century Russia is not a topic on which I've read a great deal of non-fiction, therefore I was willing to accept Marlow's portrayal as accurate even though, to me, the count did a lot of things I would have thought he'd delegate. But perhaps that's just him and/or because he's minor nobility and not Petersburg high society. One thing I would say as a positive for this story, though, is that it makes a good introductory piece to 'Russian' literature. For those who find the works of Tolstoy and Dostoevsky a bit daunting, Who Is To Blame? is an excellent midway text to ease you in and prepare you for tackling those works with their huge casts and complicated Russian naming patterns. Overall, I would say that Who Is To Blame? , while not without its faults, is a pleasant, easy historical fiction read.